As more people have moved towards reducing their “carbon footprint” paper recycling has continued to increase. However, throwing your documents into the recycling bin just because they are paper, may not be the safest move. A good way to understand the differences between recycling and shredding paper is to look at the process of each and compare the security of the two. The results we found are illustrated below. It is important for people to understand putting items into the recycling bin is in no way safer than disposing of your items in a garbage bin. Listed below are 5 dangers that come with putting your personal documents in a recycling bin. In 1988, the U.S. Supreme Court ruled that police officers did not need a warrant to search through home owner’s garbage bags when they are placed on the curb. This means it is legal for any person to go through your trash or recycling once it is on your curb to be picked up. Recycling trucks look like any other garbage truck. Your documents will be blown around in the back of the truck, mixing with other people’s personal documents/items, and then dropped off at a recycling facility. Sometimes your documents sit on sorting floors for 2–4 weeks before they are ever destroyed. If there ever came a time when you needed to show proof of a document being destroyed in an event of an audit or litigation, you would have no way of showing you had it destroyed in a recycling facility. Paper needs to be sorted in different grades before it can be recycled. This can be done to an extent by machines, but people are also hired to help sort what the machines cannot. On top of this, there are companies that have to do the entire sorting process by hand—your documents can go through the hands of multiple employees before it is ever recycled. This gives dozens of people direct access to your documents without you even realizing it. Recycling companies make their money based on the quality and the value of the items being recycled. The facilities care about cleaning and separating the content to make the biggest profit. They do not care about the privacy of the documents being destroyed. Professional shredding services offer mobile shredding, offsite shredding, and drop off shredding for individuals and businesses. Whether you want someone to come to you and shred right in front of your eyes or you want a provided, locked bin to be picked up at your home or office, you will always be able to witness how secure your documents are. Trucks are sent to your location and collect your locked bins filled with your documents that need to be shredded. They are then transported to a secure facility to be destroyed. Right after your documents are destroyed you will receive a certificate of destruction so in the event you need to show when and where you destroyed a document for legal purposes, you will have a record ready to prove your case. Your documents will be shredded at a secure facility, and the paper remnants will then be recycled. Our contractors and drivers never come in contact with your documents during, before, or after they’re shredded. This gives you a chance to maintain your document security while still reducing your carbon footprint. 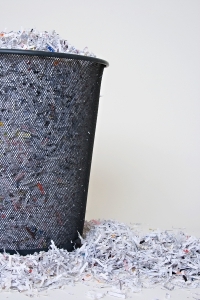 Shredding companies are dedicated to conserving your privacy and preventing identity theft. Their whole process is designed to keep your documents as secure and private as possible while simultaneously keeping you in compliance with state and federal laws. When comparing recycling to shredding paper there are clear reasons why you should choose to shred your important documents. Recycling is an important part of the world we live in, but for your own safety, you can go one step further when shredding your documents by letting a facility securely destroy your documents and recycle the pieces. This way you can have the best of both worlds. Shred Nations has a network of contractors waiting to compete for your businesses. Whether you want mobile shredding, offsite shredding, or prefer to use one of our drop off locations, we will get you connected with a company ready to meet your privacy and environmental needs. For more information on any of our available shredding services, call us today at (800) 747-3365 or fill out the form to the right, and in minutes we will provide you with a free quote today. Recycling is one of the best ways to protect our environment and our future; the problem is, you may feel uncomfortable throwing important documents into your recycling bin with the extreme threats of identity theft. Here is a great in-depth guide outlining the benefits recycling has on the world. What Happens to Paper After It’s Shredded? No paper can be recycled unless it goes through quite the process. Below outlines the top steps it takes to transform shredded paper into recyclables. The following infographic outlines how shredded paper goes from bits of paper to recycled goods. 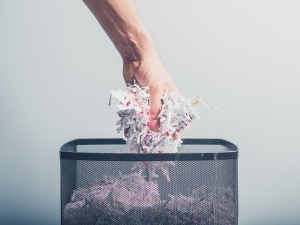 Shredding your paper at home is a great way to destroy small amounts of documents housing sensitive data. However, sometimes recycle pickup services or waste pickup services don’t accept paper shreds—especially if they are mixed in with other recycled material.